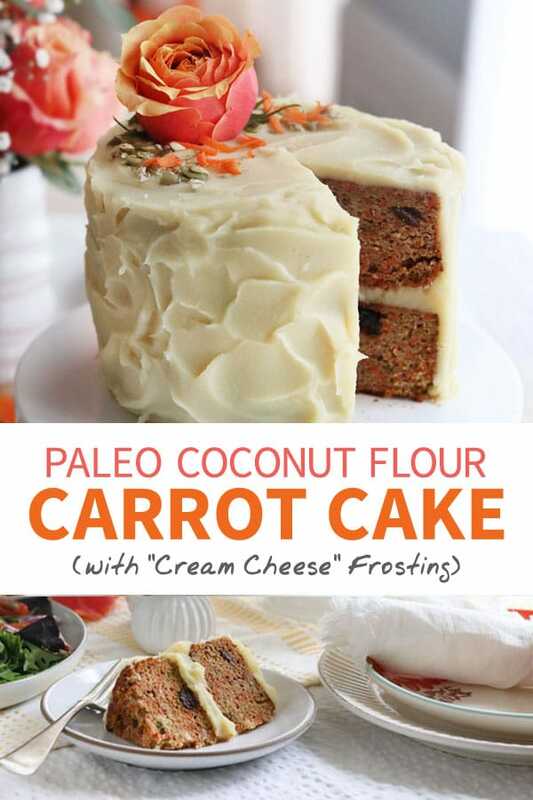 This Paleo Carrot Cake is made with coconut flour, for a naturally grain-free and gluten-free dessert. I love how moist and flavorful it is, while being naturally sweetened! What I love about coconut flour is that it’s naturally gluten-free and high in fiber. In fact, it’s so high in fiber that it actually needs quite a few eggs to help give it lift and moisture. That means this cake it higher in protein than traditional recipes, which should leave you feeling satisfied and without crazy blood sugar spikes. To properly measure coconut flour, dip the measuring cup into the bag of flour, then use the back of a knife to level-off the top. Don’t use a heaping measure, as it will result in a dry cake. 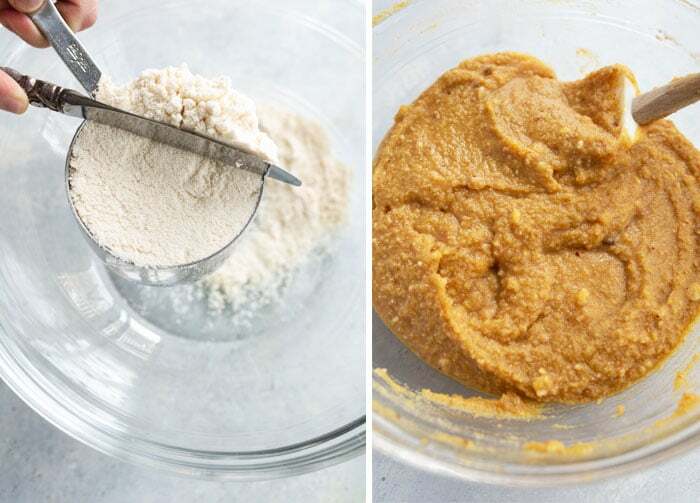 When working with coconut flour, it’s important to note that traditional substitutions will not work with recipes that have been developed for this grain-free flour. Coconut flour can NOT be swapped for almond flour, oat flour, all-purpose flour, or any other flour. It’s just too different! You also should not substitute a flax egg for any recipe that calls for coconut flour– the results will be very flat and mushy as a result, and not something you could serve to guests. I recommend looking for a different recipe that uses another type of flour in that case. 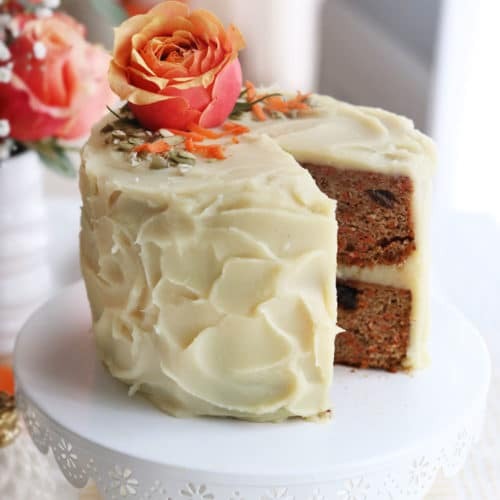 This carrot cake recipe couldn’t be easier to make. You need just one bowl and about 10 minutes of prep time before it goes in the oven! For an impressive two-layer cake, you can pour this batter into two 6-inch pans, or you can double the recipe to fill two 9-inch pans. I’ve also baked this cake in a bundt pan for a pretty presentation. I like to frost this cake with my Vegan Cream Cheese Frosting, which is naturally sweetened and made with white sweet potatoes. I love how fluffy it looks, like real buttercream! (However, this one doesn’t fool my picky 5-year-old, who has tasted “real” buttercream.) 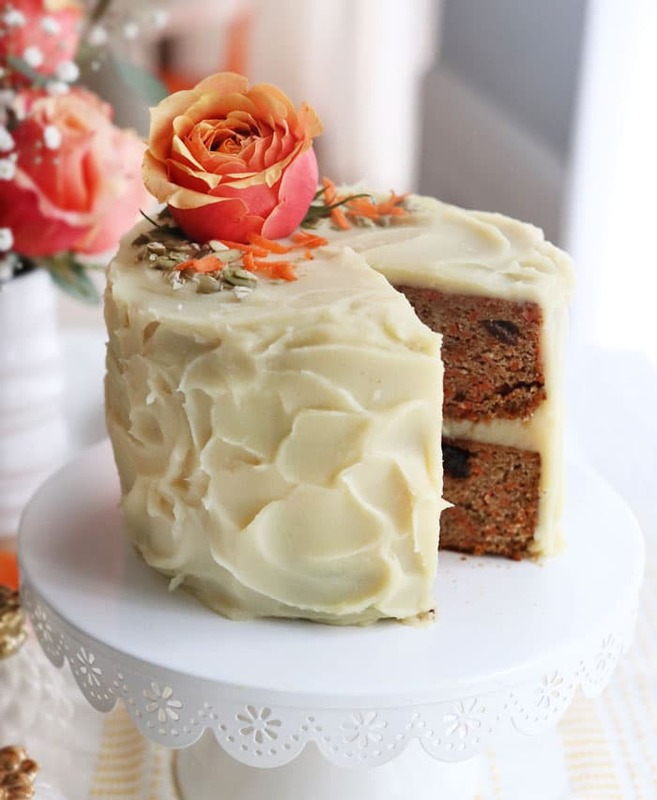 I use a double batch of this frosting to generously frost this two-layer carrot cake. Alternatively, you can drizzle this cake with my Maple Pecan Glaze or Cashew Frosting, or simply dust it with a little powdered sugar, if you like. 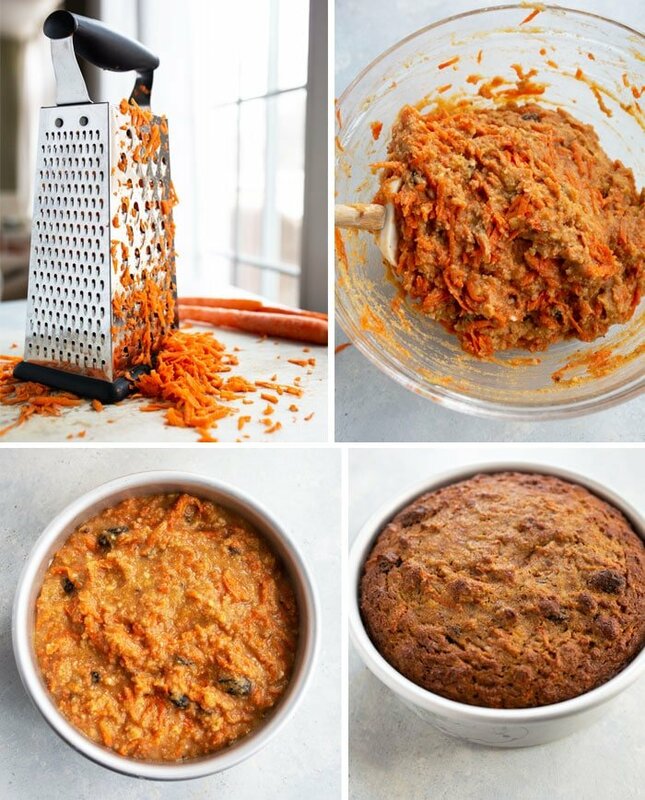 This PALEO CARROT CAKE is a healthy dessert made with gluten-free coconut flour. I love that it's grain-free and naturally-sweetened! To prepare the cake, combine the coconut flour, maple syrup, coconut oil, eggs, cinnamon, ginger, nutmeg, salt, lemon juice and baking soda, and whisk well to create a uniform batter. If any of your ingredients are cold the mixture will be thicker than traditional cake batter, but don't worry, it will still bake just fine! Once the batter is uniform, stir in the shredded carrots, pineapple, and raisins (if using). Allow the cake to cool in the pan for 20 minutes, then transfer to a wire rack to cool completely before frosting. 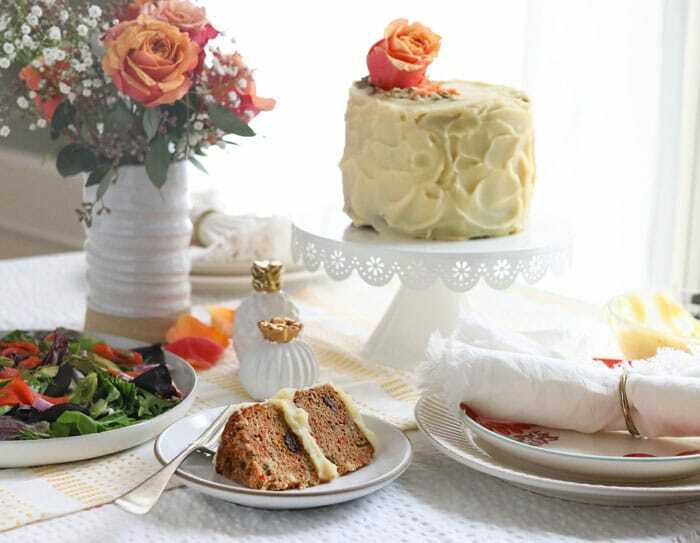 For best shelf-life, store the cake covered in the fridge for up to one week. This recipe should make roughly 24 cupcakes, so feel free to reduce the ingredients by half if you don’t need that many. In my experience, coconut flour cupcakes need to bake for about 30 minutes, and I like using silicone baking cups to avoid any sticking. For a fluffier frosting, you might want to try using Coconut Whipped Cream (<- recipe) the way I did on these pretty Applesauce Cupcakes. If making this cake how much vegan cream cheese frosting do you recommend making to frost this cake well enough? If you want it to look like my photo, I used a double batch of the vegan cream cheese frosting– there was a little leftover. Thank you, can’t wait to try it out! I want to make this cake for Easter dessert. What kind of 6 inch pans? I need to buy some off of Amazon…6 x 2 or 6 x 3? I believe mine are 6 x 3. Always a good idea to have extra height! Will you cashew frosting be firm enough to frost this type of cake or do you have to do more of a drizzle with it? It’s more of a drizzle. I was thinking maybe I could add arrowroot starch to it to help it thicken (like powdered sugar) but I haven’t tested that to be sure yet! I’m happy to fund a recipe using coconut flour. It looks and tastes nice. Mine needed to keep baking for a very long time. It was dark on the outside but very moist on the inside. Next time I will cut down on the maple syrup because I found it to be too sweet and a bit too wet. Is there a way to omit the lemon juice? I cannot have anything acidic. Can you substitute the eggs for flaxeggs ? No, unfortunately flax eggs don’t work well with coconut flour. The cake won’t rise and will have a mushy texture. How can this cake be dairy free when it contains 8 eggs? Eggs are not dairy. Dairy is anything milk-related, from dairy cows. Exactly what I was looking for! I used homemade date paste Instead of maple syrup for fiber! I’ve made it twice and even my stubborn junk food friends liked it! Can the recipe for your carrot cake cupcakes in your cookbook be poured into a bundt pan (like this recipe) and still come out okay? Or will there not be enough batter since it is for cupcakes and not a cake like this recipe, and it will come out on the smaller, flatter side? 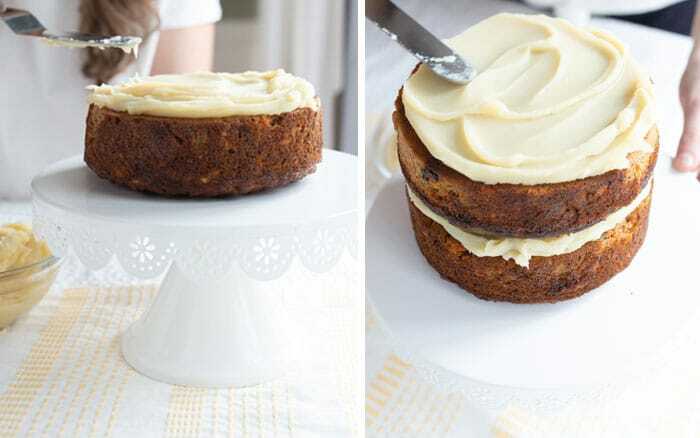 I actually don’t have enough ingredients to make this version of carrot cake, but can make the cupcakes. I plan on serving it at a mom’s night at my house, and I think the bundt pan version is so pretty, but wasn’t sure what it would come out looking like with the cupcake recipe. I’ve never tried that recipe in the bundt pan, so I’m not sure. My guess is that it might not fill the pan as high, so you’d have a shorter bundt… which could still be cute? The only thing I hate about bundt pans is that they are sometimes hard to remove the final cake, and that’s especially true with coconut flour. So grease it VERY well! Your carrot cake cupcake recipe worked really well in the bundt pan, by the way. I greased it really well like you said, and it did not stick at all. It rose really nicely too. Was not flat. Thank you for the wonderful recipe! I made this yesterday, two 8 inch round pans, everyone gave it a thumbs up, including my mom. I replaced the lemon juice with 1 T vanilla extract, used half melted Kerrygold butter and half coconut oil, cut the maple syrup back to 3/4 cup. I added closer to 3 cups of grated carrots. Other than those changes, I followed the recipe as written. I used the maple pecan glaze, but next time I make that I will reserve half of the pecans to chop and garnish the cake. My daughter decorated the cake with whole and chopped pecans! very pretty! This cake is really good. I followed the recipe exactly as written. Very moist and delicious. I was skeptical about the amount of eggs but it is perfect.